Efren Corado Garcia (in blue) and the dancers of Repertory Dance Theatre in Bebe Miller’s "Event.” Photo by Sharon Kain. Watching Repertory Dance Theatre’s Voices, a show that reiterated the company’s theme this season of “Manifest Diversity,” was a distinct pleasure. Nearly every piece was preceded by a video featuring the choreographer, or re-stager of the original choreography, providing a glimpse into their intent and process, which I found to be particularly effective and illuminating for a non-modern trained dancer such as myself. This was something I especially appreciated throughout the evening: the thoughtful, unobtrusive way in which these videos blended and drew connections through the program, which then became as much a part of the program as the dances themselves. They were like delightful appetizers followed by a sumptuous main course. The program itself was a varied menu with distinctly different flavors, some emotionally gratifying, others intellectually appealing, and all of them aesthetically pleasing. The first piece, “Passacaglia and Fugue in C Minor,” was originally choreographed by Doris Humphrey in 1938 and was “inspired by the need for love, tolerance, and nobility in a world given more and more to the denial,” according to the program notes. In the introductory video that featured Nina Watt and Jennifer Scanlon, who re-staged the piece, the audience was reminded that “Passacaglia” was originally conceived while fascism was on the rise in Europe. The significance of that historical context in today’s world was not lost. “Passacaglia” was a lyrical piece, glorious and effulgent in the dazzling confluence of Bach’s music and Humphrey’s choreography, and transported me to a different realm. Lauren Curley and Dan Higgins led movements that found their refrain in the ensemble silhouetted in a pyramidal configuration on boxes, some seated, others standing. There was a sense of conductor and choir, song and chorus, and the struggle of dynamic leadership, as each dancer seemed to be every other dancer, an individual yet uncompromisingly part of a whole. The blue-lit background and white costumes accentuated the arabesques and turns and further underscored the uplifting nature of the piece. RDT in “Passacaglia and Fugue in C Minor” by Doris Humphrey. Photo by Sharon Kain. Second on the program was the world premiere of “Event,” an incisive and interrogatory piece, with a distinctly different tone, choreographed by Bebe Miller. It was a joy to watch and a joy to listen to. Miller, in the introductory video, first told us that she is not a “storyteller” and that she began by observing who the dancers were together and allowing “the serendipity of interaction” to come to the fore. I found it intriguing to listen to her choreographic process. Her piece centered around the idea of an event occurring in a room of 6 people, which then gradually evolved/devolved from event into narrative, focusing more on each observer’s interpretation, feelings, and sentiments, the recall of it, and the correspondent emotions. “Event” featured a brilliant score by Mike Vargas that highlighted a penetrating text by Ain Gordon, crisply delivered in this context by Miller. The movement was dynamic and accurately reflected Miller’s intent. Real drama was conveyed by the eight extremely strong dancers in the telling, retelling, and diverse experiences of the “event,” until the “event” became the remembered experience and no one really cared or could recall what the original “event” was. What I really loved about the piece was that I totally got it. I often struggle to understand the intent behind some modern pieces, but not here. The dancers were that effective in their spatial configurations, their energetic movements, and their convincing facial expressions (Abhinaya, as we call it in Bharatanatyam). I sincerely hope that RDT continues to collaborate with Miller. RDT in “I give myself” by Bryn Cohn. Photo by Sharon Kain. The next piece, “I give myself,” was choreographed by Bryn Cohn and was also a world premiere. As highlighted in her video, Cohn’s choreographic process starts with aesthetic empathy and articulation. She observed, and thus is able to spotlight for the audience, the energetic traits and mutual connections between the eight company dancers. The score, which felt unbroken but was actually three distinct sections, was composed by Michael Wall. “I give myself” began with dark undertones; there was a relentless feeling of dread in the sometimes convulsive movements and the music reinforced this sentiment. It did gradually evolve to become a more optimistic endeavour, with the sense that the dancers withheld nothing and “gave themselves,” surrendering their vulnerabilities to interactive movements and embodying a confidence and mutual trust. The stark lighting, by Pilar, and dark costumes were effective as well, further emphasizing the sheer strength and technical prowess of each dancer. 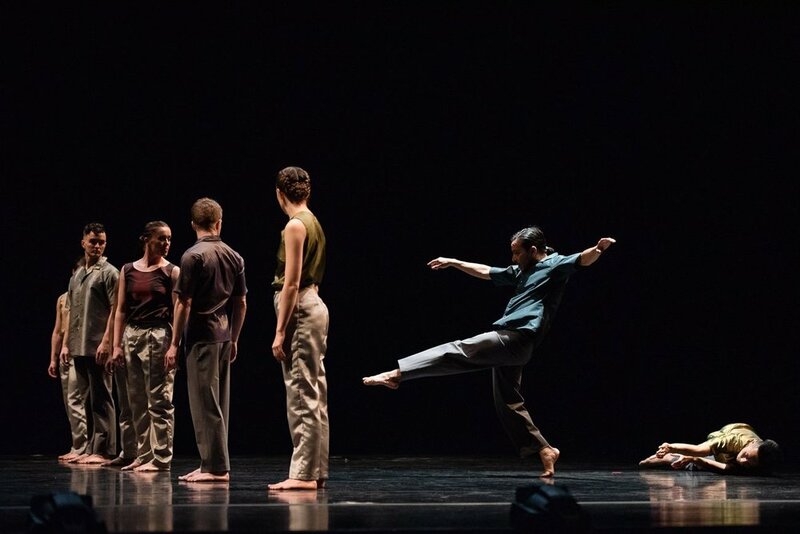 The next piece, “Voices,” was a lovingly crafted tribute to Salt Lake City’s community of dancers, teachers, and mentors, choreographed by Nicholas Cendese with input from the performers, who were dance educators from across the Wasatch Front. The piece had a gentle, lilting feel to it, and the plethora of “voices” that informed it shone through without being discordant. It was moving to see and appreciate the generous contributions of local dance educators; our community, I have come to recognize, has one of the richest, most supportive dance cultures in the country. Israeli choreographer Danielle Agami’s “Theatre” was the last piece on the program and was “dedicated to non-actors,” according to the program notes. Incredibly athletic in scope, the piece had the dancers fittingly attired in costumes with numbers on the back, as though they were members of a sports team. There were moments where the dancers would build up enormous momentum, bump into an invisible barrier, stop, and then recede with such control and finesse; at other moments, they seemed to engage in common exercises that one might see a team do before a match, except magnified and transformed with an inexplicable panache. Tyler Orcutt in Danielle Agami’s “Theatre.” Photo by Sharon Kain. The extremes to which Agami pushed the dancers of RDT, getting them to explore their limits or perhaps realize that they have none, was a powerful display of mutual enjoyment and a feat of singular stamina. Agami informed us in her video that she is interested in seeing how dancers convince her that they are engaged in her fantasy, and then uses that as a medium in creating her work. One could see RDT’s exceptional and diverse dancers rise to this challenge, and with support and encouragement, exult in exceeding any confines to create a fitting finale to the evening. RDT is currently comprised of Jaclyn Brown, Lauren Curley, Daniel Do, Efren Corado Garcia, Dan Higgins, Elle Johansen, Tyler Orcutt, and Ursula Perry, an excellent ensemble who had us at the edge of our seats. I learned, speaking to a friend, that this was Efren Corado Garcia’s final season with the company. His note in the program thanking local employers for their flexibility in accommodating dancers’ schedules caught my eye and brought a lump to my throat: "All of you dealt with my tired body, long working days… your patience, commitment to me… helped me live a dream." “Voices” was a banquet to be relished, and I left the theater satiated and eager for another program by Repertory Dance Theatre. Principal Artists Beckanne Sisk and Chase O'Connell as Tatiana and Onegin. Photo by Beau Pearson. Even though John Cranko chose the title Onegin for his ballet based on Alexander Pushkin’s verse-novel, I find its power resides in the dancer playing the role of Tatiana. It is her transformation, from withdrawn and innocent to forthright and assertive, that makes the story so compelling. For this reason, among many others, Onegin is a riveting and important addition to Ballet West’s repertory: the women in the company shine in Cranko’s challenging and dramatic choreography. Onegin is built upon a series of contrasts: between sisters, between couples, and between different phases of our lives. The credibility of the story depends upon dancers’ ability to portray these contrasts without slipping into caricature. On Saturday night, April 6, Beckanne Sisk as Tatiana and Chelsea Keefer as Olga captured the perfect balance between Tatiana’s diffident personality and Olga’s bubbly disposition. Their sisterly affections and squabbles made them endearing and relatable. The fondness they shared for one another in Act I contrasted with Onegin’s treatment of Tatiana, Olga, and Lensky in Act II. In many ways, Onegin’s character became apparent through the differences he presented: aloof and self-involved instead of attentive and engaging. Every detail of the production’s design emphasized these differences: his dark clothing contrasted with the women’s light, pastel dresses (costume and set design were by Santo Loquasto), and his gaze was often skyward and his gait measured and deliberate. In the role of Onegin, Chase O’Connell presented these differences with a masterful touch, intertwining his choreography with the emotions they conveyed. As tensions escalated between the couples in Act II, with Onegin pulling Olga away from Lensky, and Lensky growing increasingly jealous, their dancing intensified the conflict: the choreography and partnering accelerated and its speed and complexity made visible Lensky’s churning confusion and rage. Jordan Veit beautifully performed the role of Lensky, making his conflict between romance and pride both believable and devastating at the same time. Soloists Jordan Veit (left) and Chelsea Keefer as Lensky and Olga, with artists of Ballet West. Photo by Beau Pearson. As a choreographer, Cranko portrayed these plot tensions with a layered approach: there are often two relationships developing simultaneously on the stage. For example, in Act II, Olga and Lensky are visible in the background as she reassures him that her dancing with Onegin is meaningless, while Tatiana performs a solo in the center of the stage that evokes her infatuation with Onegin and discouragement with his dismissal. This kind of simultaneity gives Onegin a cinematic feel: the layering creates a sense of momentum and inevitability, one relationship becomes irrevocably entwined with another. Cranko’s movement design is not only emotionally driven, but also technically complicated. As Olga, Keefer performed her choreography with clarity and ebullience that matched her role: the ballotté steps that began her solo in Act I were buoyant and sparkling, and her turns perfectly captured the swirling attraction she felt towards Lensky. The entire cast enriched Saturday night’s performance: towards the end of Act I, when the neighbors and relatives of Madame Larina dart across the stage in a diagonal, with the women performing grand jetés, and the men assisting them as they run alongside, the audience burst into applause. It is a testament to the caliber and artistry of the company that they make this ballet, choreographed in 1965, feel fresh, exciting, and relevant today. Although Cranko’s works are brilliant and proving to be timeless, they require large casts of dancers who blend precise attention to details in group formations, with the ability to portray characters and plot developments believably. In his obituary in the New York Times, from 1973, there’s a quote from Cranko that states, “There is the challenge of making a ballet work on two levels—as dance and as story. You fail only if the story becomes more important than the dance.”  The dancers of Ballet West excel as both technicians and story-tellers. Artists of Ballet West in John Cranko’s Onegin. Photo by Beau Pearson. The word “immersive” is often used to describe events where audience members are in close proximity to dancers or actors, but watching Ballet West perform Onegin, I felt another kind of envelopment. The characters were performed with such credibility, I became absorbed in the conflicts that each of them encountered: Sisk as Tatiana began the performance as a young, introverted, and bookish woman, who transformed into a commanding presence. O’Connell as Onegin conveyed his character’s path from reckless to regretful with such conviction that I felt a newfound appreciation for this role. I also began to wonder about the mirrors that appear throughout the first act, from the scene when Olga “discovers” Lensky in her reflection, to the mirror pas de deux between Tatiana and Onegin. Are these Cranko’s way of commenting on reflections, and the contrasts between what we desire for ourselves and how others see us? Undoubtedly the music and production design contributed to my sense of absorption: Jared Oaks conducted the Ballet West Orchestra and the music by Tchaikovsky (arranged and orchestrated by Kurt-Heinz Stolze) supported and intensified my emotional engagement with the dancing. The sets and costumes, courtesy of the National Ballet of Canada, added sumptuous visual layers to the performance. Although I love how the program contains translations of Pushkin’s writing, specifically the letter that Tatiana writes to Onegin, and Onegin’s letter to Tatiana, I found this offered yet another contrast: Cranko’s Onegin performed by Ballet West is a rich and lived experience that conveys Pushkin’s multifaceted characters in ways that words cannot convey. The gestures, actions, and partnering of the dancers communicate viscerally and kinesthetically the turmoil, heartbreak, and resolve of Pushkin’s characters. In Ballet West’s dancers, Cranko’s choreography finds a perfect company to transport us into and through this enthralling and revealing story.